All the cable car lines of San Francisco. The period of greatest mileage was the early 1890s. The last three miles of service to the Pacific Ocean was provided by cable car company owned steam train service. Editor’s Note – The routes shown below are for each line at its maximum length, as operated by one of the eight original San Francisco cable car companies. Some routes, for example, the Sutter Street Railroad’s Sutter Street line were created in stages. This page should also be consulted for details after a company became part of another company. Also, please refer to maps as an aid. As part of the U.S. 1890 census all San Francisco street railways were evaluated with respect to their operating characteristics. For the Eight Original San Francisco Cable Car Companies this data is listed. Please note that after 1890, some expansion occurred that would increase certain company’s scope of operations. For example, the California Street Cable Railroad added two lines – the O’Farrell, Jones & Hyde line and the Jones Street Shuttle – and the Market Street Railway (successor to the Ferries & Cliff House Railway) extended their Sacramento - Clay line to Golden Gate Park. Detailed map showing the San Francisco cable car system at its greatest extent in terms of mileage, 1890s. Not all lines shown operated at the same time. In September 1887 the Ferries and Cliff House Railway purchased the Clay Street Hill Railroad. On September 30, 1888, the Ferries & Cliff House Railway started its fourth line – Ferries & Jackson – that ran from the Ferries to Central Avenue and California. This line used Sacramento Street outbound to Powell and Clay Street inbound from Stockton. Clay Street Hill Railroad was now cut back to Powell from Kearny. On September 9, 1891, Clay Street Shuttle (Powell to Van Ness Avenue) was discontinued to create new Sacramento-Clay line that opened that November 2. All cable car operations were discontinued on Clay Street between Larkin and Van Ness Avenue. This accounts for the multiple colors shown on Clay Street. Please refer to Cable Car Historical Time Line for details of Cable Car routing and dates of operation. Map by Jack Neville. Because of the 1906 Earthquake and Fire, April 17, 1906 was the last day of full cable car service on the following United Railroads lines: Sutter Street, Polk & Larkin Cross-town line (except Pacific Avenue), Market & McAllister, Market & Haight, Market & Hayes, Market & Castro (except between 18th and 26th Streets), Market & Valencia, Jackson Street via Sacramento-Clay, Sacramento-Clay west of Fillmore, and Powell-Jackson west of Steiner Street. Also, last day for the Presidio & Ferries (Union Street line). Post 1906 Earthquake and Fire cable car lines are shown on this map. Please refer to Cable Car Historical Time Line for details of dates of operation. This map is designed for the second addition Of Cables & Grips, The Cable Cars of San Francisco by Robert Callwell and Walter Rice that will be available late 2003. The map was created by Jack Neville. Photo: Clay Street Hill Railroad line was extended from its original western terminus of Leavenworth Street to Van Ness Avenue, where this mid - 1870s view was taken. Clay Street Hill Railroad. One line, 3½' gauge, bottom grip. Service from September 1873 (testing had started that August 2) to September 1888, when it was sold to the Ferries & Cliff House Railway. Route: From Kearny Street via Clay to Van Ness Avenue. Photo: Sutter Street Railway open grip car No. 46 is at Sutter and Powell Streets in the late 1880s. No. 46 survives and is on display at the Cable Car Museum. Sutter Street Railroad (later, Railway) . Two lines, 5' gauge, side grip. Service from January 1877, until the United Railroads of San Francisco took over the company in March 1902. Sutter Street – From Market via Sutter to Central Avenue (Presidio Avenue). Polk & Larkin Crosstown Line – From Brannan via 9th Street, Larkin, Post, Polk, Pacific Avenue to Devisadero. Photos: California Street Cable Railroad ran two-car trains until 1891, when they were replaced with "California" cars - a "double-ended" car with an enclosed middle section and open sections at both ends. California Street Cable Railroad (Known as California Street Railroad, 1878-1884). Three lines, 3½' gauge, side grip on California St. line, bottom grip on the other two. Service from April 1878 to July 1951. The City and County of San Francisco purchased the California Street Cable Railroad in January 1952. California Street line – From Market & Drumm west on California to Central (Presidio) Avenue. O’Farrell, Jones & Hyde line – From Market & O’Farrell, O’Farrell, Jones, Pine, Hyde to Beach. Jones Street shuttle – From Market via Jones to O’Farrell. Photos: Geary Street, Park & Ocean Railroad pre-Earthquake and Fire of 1906 grip car and trailer, as illustrated at Central Avenue (now Presidio Ave.) and Geary in the 1890s. Combination car at Geary and Market Streets during the post Earthquake period. Geary Street, Park & Ocean Railroad. Geary Street, Park & Ocean Railroad began on February 16, 1880 with trains consisting of a grip car and trailer. Although the company received combination cars (an open section with a closed section) as early as 1892, it was until after the Earthquake and Fire, June 22, 1906 that it was totally converted to combination style cars. On May 5, 1912 the line was closed to allow it to be converted to the first electric lines of the Municipal Railway. Route: From Market, Geary & Kearny, Geary, Point Lobos Blvd. (Geary Blvd. ), 5th Avenue, Fulton to 11th Avenue, Chutes. Photo: A Presidio & Ferries Railroad cable car train is pictured at the line's outer terminal, seven months before the line opened for paying passengers, in June of 1881. Presidio & Ferries Railroad. One line, 5' gauge, bottom grip. Service from January 1882, until the earthquake and fire of April 1906. Afterwards, the company converted the line to electric streetcar service. It was sold to the City and County of San Francisco in December 1913. Route: Cable car service from Washington & Montgomery via Montgomery, Union, Baker, Greenwich to Presidio Reservation. Photo: Market Street Cable Railway No. 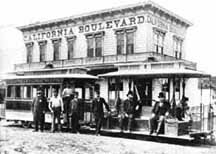 10, a 34 foot long 130 passenger combination car, is nearing the outer end of the Valencia Street line in the 1880s. Market Street Cable Railway. Five lines, 4' 8½" gauge, side grip. Service from August 1883, until it became part of the Market Street Railway in October 1893. Castro Street Line – From the Ferry, Market, Castro to 26th Street. Haight Street Line – From the Ferry, Market, Haight to Golden Gate Park (Stanyan). Hayes Street Line – From the Ferry, Market, Hayes to Golden Gate Park (Stanyan). McAllister Line – From the Ferry via Market, McAllister & Fulton to 11th Avenue (Golden Gate Park & Chutes). Valencia Street line – From the Ferry via Market & Valencia to 28th Street (Mission). Photo: A Ferries & Cliff House Railway Powell-Jackson car turns off an undeveloped Jackson Street on to Central Avenue (now Presidio Ave.) shortly after the line opened in 1888. Ferries & Cliff House Railway. Four lines, 3½' gauge, bottom grip. Service from March 1888, until the Market Street Railway took it over in October 1893. Powell-Mason – From Market & Powell via Powell, Jackson, Mason, Montgomery (Columbus) Avenue, Taylor to Bay (North Beach). Return Taylor, Mason, Washington, Powell to Market. Powell-Jackson – From Powell & Market via Powell, Jackson, Central (Presidio) Avenue to California. Return via Central, Jackson, Steiner, Washington, Powell to Market. Ferries & Jackson – From the Ferry via East Street (Embarcadero), Clay, Mason, Jackson, Central (Presidio) Avenue to California. Returns via Central, Jackson, Steiner, Washington, Stockton, Sacramento to the Ferry. (1888-1891 Sacramento outbound, Clay inbound). Sacramento-Clay – From the Ferry via Clay, Larkin, Sacramento to Walnut Street. Return via Sacramento direct to the Ferry. Clay Street Shuttle (purchased from Clay Street Hill Railroad) – From Powell via Clay to Van Ness Avenue. Photo: An Omnibus Railroad & Cable Company combination car is at the outer end of the company's Howard Street line at 26th Street in the early 1890s. Omnibus Railroad & Cable Company. Five lines, 3½' gauge bottom grip. Service from August 1889, until the Market Street Railway took it over in October 1893. Post Street line – From Market via Post, Leavenworth, City Hall Avenue, Grove, Polk, 10th Street to Howard. Howard & 24th Street – From the Ferry via East Street (Embarcadero), Howard, 24th Street to Potrero Avenue. Howard & 26th Street – Same 24th Street line except continued on Howard to end at 26th Street. Oak Street line – From Howard via 10th Street, Fell, Franklin, Oak, Stanyan to Haight (Golden Gate Park). Ellis Street line – From Market via Ellis, Broderick, Oak, Stanyan to Haight (Golden Gate Park). Market Street Railway. October 1893 to March 1902. This consolidation included the Market Street Cable Railway, Ferries & Cliff House Railway, and Omnibus Railroad & Cable Co.
At the end of January 1894, the former Omnibus and Ferries & Cliff House cable cars began to appear with new numbers, as part of “Metropolitan System.” Under this system each main line had its own number series. For example, cars operating on Sacramento Street were assigned into the 500-550 series, whereas Powell Street! c! ars (Powell-Mason and Powell-Jackson) were placed into the 401-500 series. The Market Street Cable Railway started this system in 1887 (before the opening of the Market & Castro cable). Prior to that time cars were numbered sequentially by route from 1. Thus there was a No. 1 for Market & Valencia and another No. 1 for Market & Haight, and so forth. The last vestige of the Metropolitan System ended in 1973, when the Powell Street cable cars were renumbered out of the 500 series (they were shifted to Powell Street in 1907) back into the scheme of the 1887 Powell Street Railway, namely cars numbered sequentially from No. 1. United Railroads of San Francisco. March 1902 to April 1921. This consolidation included the Market Street Railway and the Sutter Street Railway. Market Street Railway. April 1921 to September 1944. A reorganization of the United Railroads because of financial difficulties. San Francisco's voters approved its purchase by the City and County of San Francisco in May 1944. It should be noted that the companies used other forms of public transportation besides cable cars. For instance, the Presidio & Ferries Railroad's one route was served by a combination of horsecars, cable cars, and steam locomotives. Today's cable car service is provided by the San Francisco Municipal Railway (Muni), which began service with a streetcar line on Geary Street in December 1912. Muni took over the Powell-Mason line and Washington-Jackson line in September 1944, and the three lines of the California Street Cable Railroad in January 1952. The present-day three-line system – Powell-Mason, Powell-Hyde and California lines – using a bottom grip, has been in service since December 1957.